Usually when we go thrifting, I’m looking for small wood items like jewelry cabinets, boxes, and shelves. But now that we’ve moved into a new house I need a few new pieces of furniture. 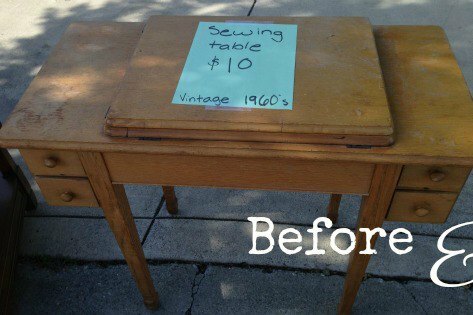 So over the next few months you’ll be seeing more thrift store furniture makeovers. Today I’m sharing some of my favorite makeovers from the past and from my blogging friends. I hope they inspire you to head to your local thrift store for some furniture! This is one of my more recent thrift store furniture makeovers. 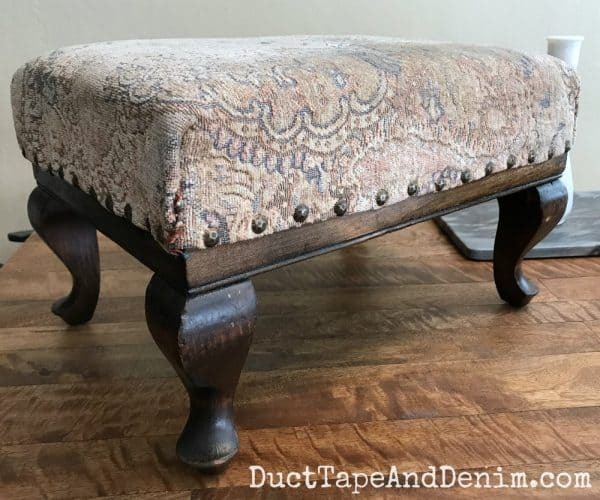 It was my first upholstered stool makeover and it turned out great. Spoiler… I used my husband’s old blue jeans to upholster it! 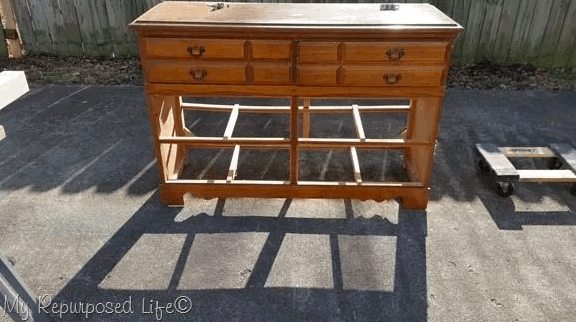 Nancy found this mahogany dresser for $35 by visiting her local thrift stores on a regular basis. That’s key to finding the good stuff! This old chair was my FIRST chalk paint project. 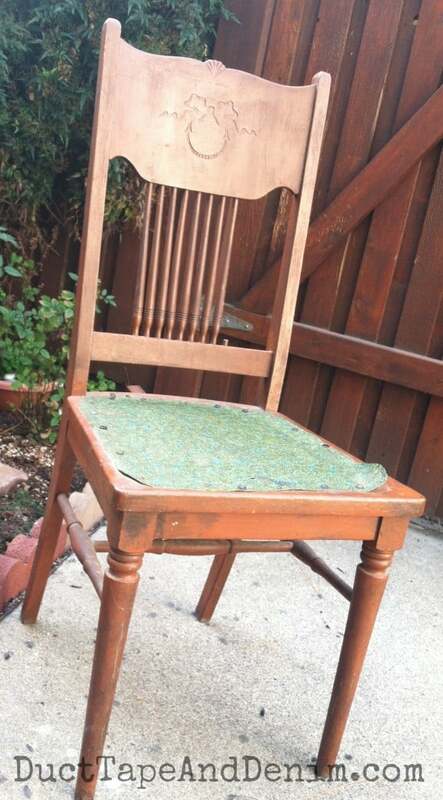 BTW, I don’t recommend a chair like this for your first project. But with a little work it still turned out great. 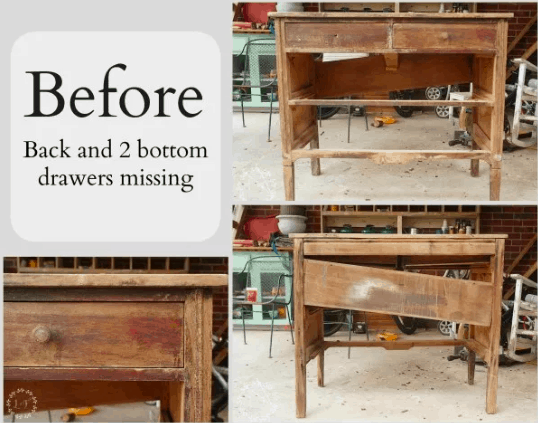 Gail bought this dresser for $10 at a yard sale and repurposed it into a hall table! Turned out beautiful! 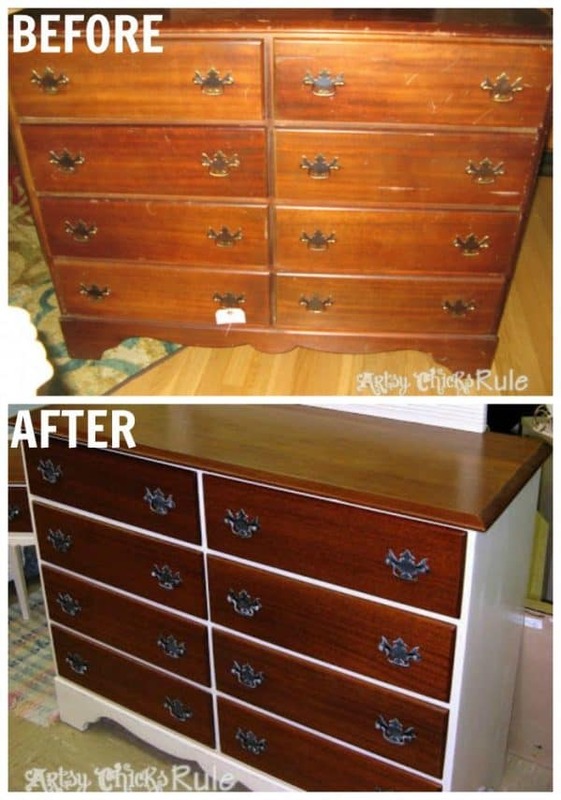 This dresser was saved from the dumpster! Although there was so much missing form it, I’m not sure you could even call it a changing table. Bikeman found this piece for me. 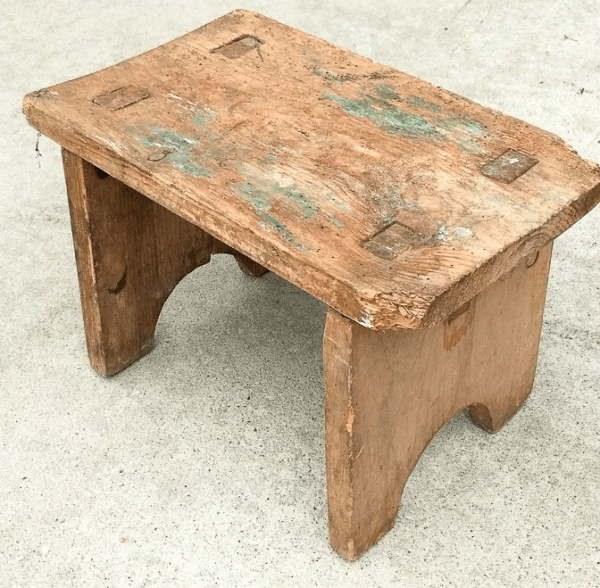 It’s not technically a thrift store find… he found it on the side of the street while out looking for garage sales. I actually found a box that fit perfectly on the top. So I painted them the same color and sold them together at a flea market. I probably would have passed up this headboard. It’s not really my style but all that flat surface was like a huge blank canvas to try out a new technique. 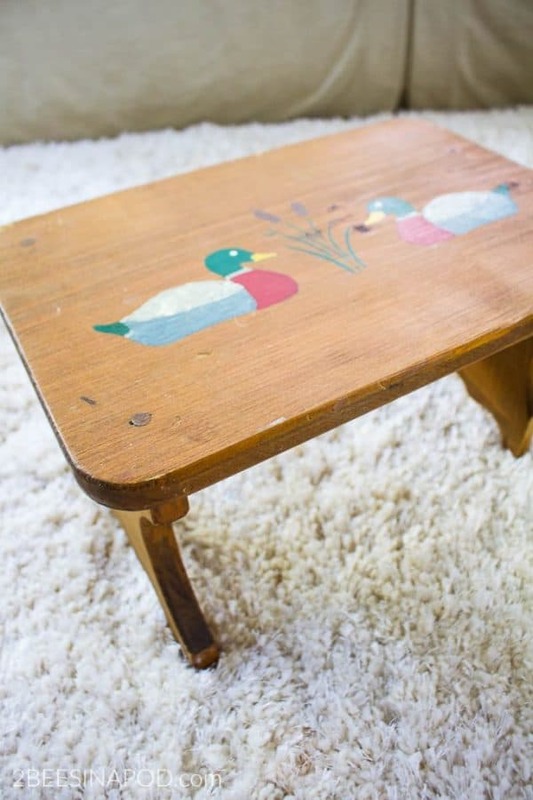 Would you buy a stool with ducks painted on it for $1.00? Vicki painted it to match her decor. 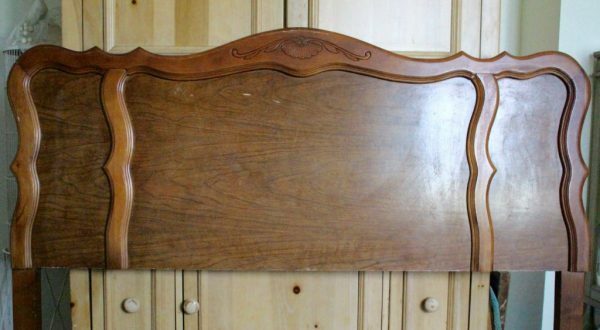 This would be an easy thrift store makeover to start out with. And yet another stepstool makeover. It’s a little rougher. This one got a paint job, complete with stripes. What is the Best Paint for Furniture? Thanks for reading! 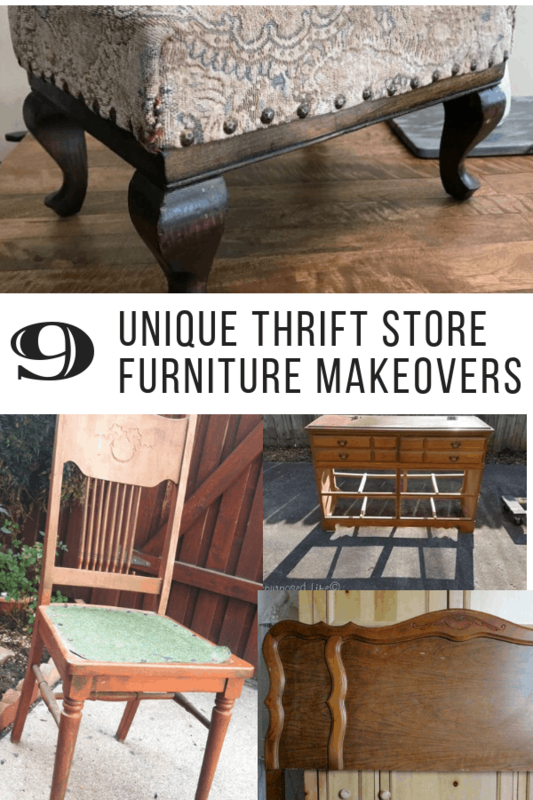 I’d love to hear about your thrift store furniture makeovers. Leave a comment and let me know what you’ve been working on. « An EASY Beef Alphabet Soup Recipe Your Kids Will Love!